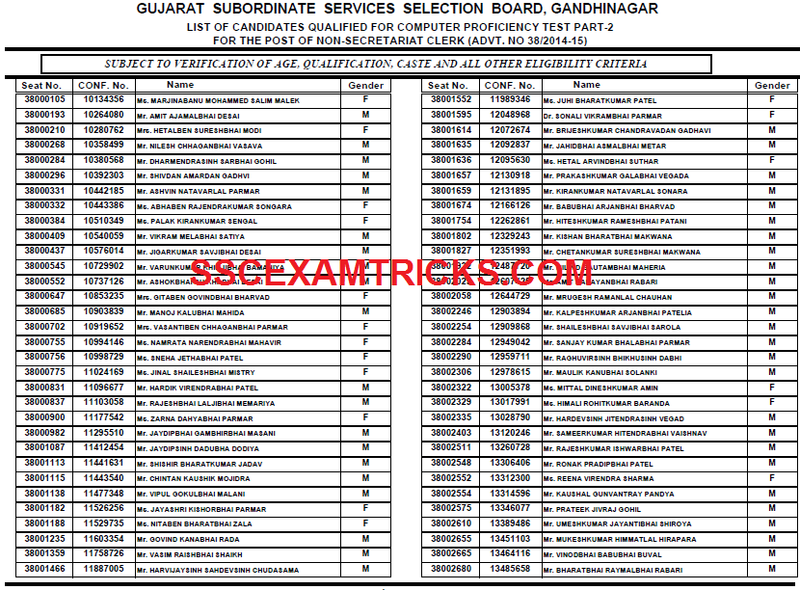 Gujarat Subordinate Service Selection Board (GSSSB), Gandhinagar has released result of computer proficiency test (CPT) Part 2 for total of 2444 vacant posts of Non-Secretariat Clerk against the advertisement no. 38/2014-15 on the official website. The list of shortlisted candidates who has qualified for CPT Part 2 has released in which seat number, Conf. No. Name of the candidate and Gender of the candidate is displayed. These shortlisted candidates are subjected to verification of age, qualification, caste, and all other eligibility criteria of the candidate to check originality candidature of the candidate. Earlier GSSSB had released advertisement notification for 2444 posts of Bin Sachivalay Clerk through online application till 08th October 2014. A huge numbers of 12th pass/ equivalent candidates had applied for the posts. The written test was conducted on 21st December 2014 in which many candidates had qualified for these posts and called for Computer Proficiency Test (CPT). Those candidates who had appeared in Computer Proficiency Test (CPT) Part 2 can download their result from the direct link provided in the end of the posts. The Final Selection is to be done on merit basis based on performance in written examination and CPT. There will be NO INTERVIEW for the final selection of GSSSB Clerk. The exam was conducted on 21st December 2014 by Pen MODE. Paper was of multiple choice questions (MCQ) of 200 marks given in Paper 1 & Paper 2 in which question contained various question to check mental ability of examination. In exam four options were provided to choose one right answer among them. The total time for each examination was 90 minutes. The short listed candidate was called for Computer Proficiency Test (CPT). A typing test was conducted to check the typing ability and accuracy on computer typing for Gujrati and English Language words per minutes. Now the short listed candidates based on the performance in CPT will go for document verification stage.